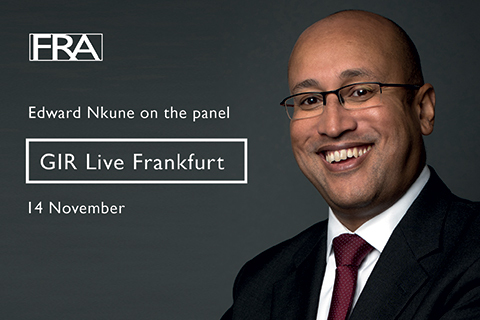 FRA’s Edward Nkune joined Christine Braamskamp, K&L Gates, Olaf Schneider, Bilfinger SE, and Dr. Christopher Wenzl, Prosecutor’s Office Frankfurt am Main on the panel Grey Areas and Judgement Calls: How to structure and strategize a cross border investigation at GIR Live Frankfurt in November. GIR Live Frankfurt focussed on cross-border investigations and covered a number of aspects including conflict between laws in different jurisdictions and the life of a global investigation. The panel examined how an investigation might be structured from the outset; what strategy to adopt once the investigation is underway and more detail is uncovered: and what might the end game look like, including the potential for fines and a monitorship. – There are a number of differences between the attitudes of German prosecutors and the UK SFO. One particular example is the prevalence of “dawn raids” conducted in Germany. Whilst the SFO in the UK also conduct these type of searches it is fair to say that they are more infrequent, with a preference for use of Section 2 powers requiring the production of information. – One thing both on which both sets of investigators concurred was their desire for cooperation from the organisation being investigated. Whilst all panel members agreed that this would be conducive to limiting the organisation’s exposure further down the line, there was lively debate surrounding the idea that a defendant could be expected to do the prosecutor’s job for them. – It was apparent that it is vital to ensure that an investigated organisation “ring fences” its relevant data and key people, especially with regard to actual or perceived destruction or tampering of evidence. Transactional analyse of the data will be at the centre of deciding the level of, if any, misconduct. – Other than the directly involved parties there are a number of additional stakeholders that need to be considered. It is important to manage information flows and the balance between providing too much, too little, incorrect or inconsistent information. The latter is particularly important to law enforcement. – Calculation of the value of misconduct needs to be performed as soon as possible. The more accurately a company is able to understand the financial ramifications of the wrong doing, the more able it is to plan and the more it will be able to instil confidence to shareholders or other stakeholders. It shows that management are on top of the issue. However, assessing likely penalties, disgorgement and costs of remediation is complex, particularly when projects under scrutiny are historic. External expertise and experience will be urgently needed. However, it is only at the end of the negotiation between counsel and law enforcement that a final figure can be calculated. – As well as a financial sanction, an organisation entering into a DPA could expect to be assigned a monitor. Their role is to independently assess and monitor the organisation’s compliance with the terms of a deferred prosecution agreement so as to specifically address and reduce the risk of any reoccurrence of the misconduct. Independence is key and whilst the Monitor is responsible to law enforcement who need to ensure that the company is actually addressing any compliance gaps the monitor must also ensure that monitorship is risk based and proportional. – This is achieved by sticking to the mandate of the monitorship. An excellent outcome is if the company uses the monitorship as an opportunity to overhaul its compliance regime and thinks of it like this, rather than an unwanted intrusion. Welcoming, as much as it can, a second set of eyes which allow it to confidently feel that its house is in order. A frequent and open dialogue with law enforcement or the regulator is key. A culture of cooperation along with feedback from the company can ensure that recommendations are practical and realistic. A full report from the event will follow on GIR.